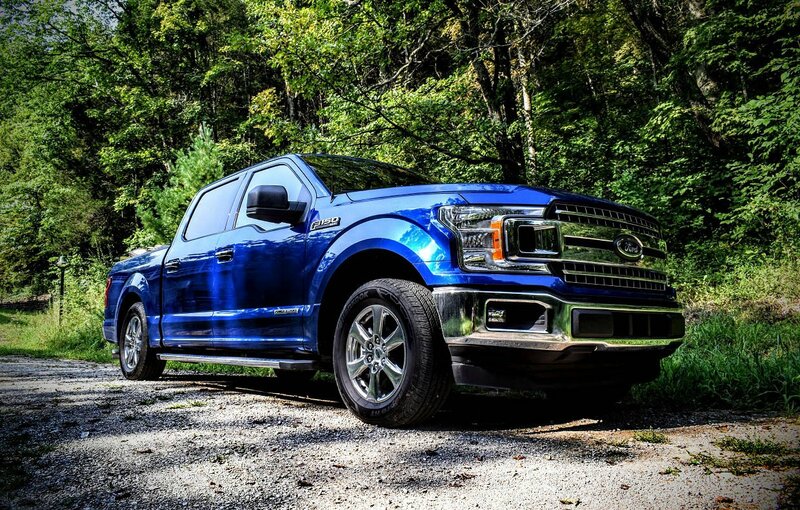 “It’s about damn time,” should have been Ford’s product punchline for the F-150 Power Stroke pickup, because every time I spoke with someone about this diesel V6 option, they said the exact same thing. No comments on the color. No feedback on functionality or mildly updated aesthetics. Hell, even the brilliance encapsulated within the all-new SYNC3 infotainment system couldn’t override the fixation this turbo-diesel V6 creates, and after a week of putting the latest spin on America’s favorite pickup through its paces, I too found myself becoming infatuated with the Power Stroke outfitted F-150. For years we’ve wondered when Ford would outfit its best-selling truck with a diesel engine, and now that it’s here the only thing I could think of was, “Let’s put this thing to work!” Being of sound DIY mind and body (at least so it’s been rumored), I took the F-150 Power Stroke out to my friend’s farm to collect river rock for the backyard, along with a healthy array of wood for various household projects. 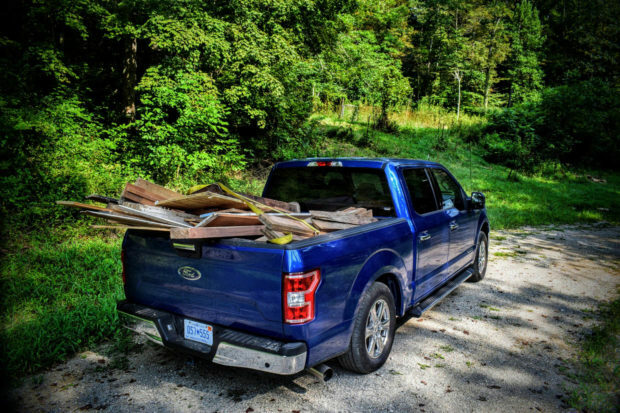 My goal was twofold: Score as many materials as possible, and then haul it all back to the house while testing the Power Stroke’s mettle over the course of a hilly 30-minute drive home. First of all, being that my test mule was a 4×2 SuperCrew model with the shorter 5 1/2-foot box, bed space and off-road adventuring were an immediate cause for concern, with the latter of the two being eliminated from thought almost immediately. That said, Ford does offer this truck with five drive options, including Normal (street driving), Tow/Haul, Rain/Snow, Eco, and Sport. Due to the wide array of weather in Cincinnati that week I was able to test all of these drive settings, with the Rain/Snow setting offering outstanding rear-wheel traction in the wet, and Eco returning mpg interstate averages that hovered just below the projected 30 mpg highway rating for 2WD models. As for Normal mode, you get a fairly balanced blend of traction, efficiency, and thrust when pushed, but after playing with the various drive settings, Sport mode emerged as the obvious choice for increased acceleration. 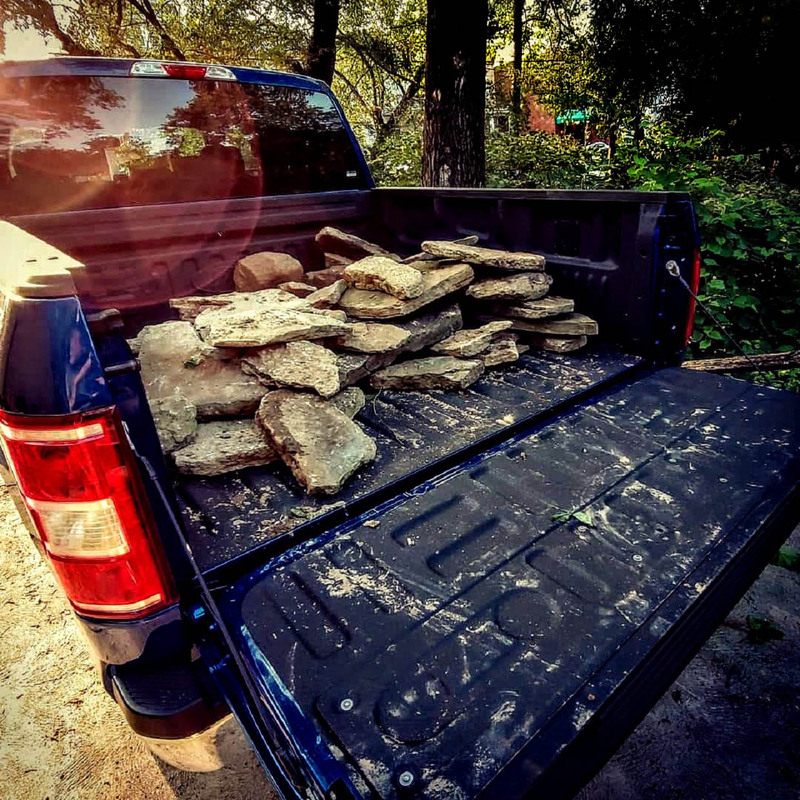 While there is some lag to be had down low (due in part to the vehicle’s weight and the efficiency-focused Hankook Dynapro HT rubber underneath), Sport mode is a surprisingly potent feature in the F-150 Power Stroke. 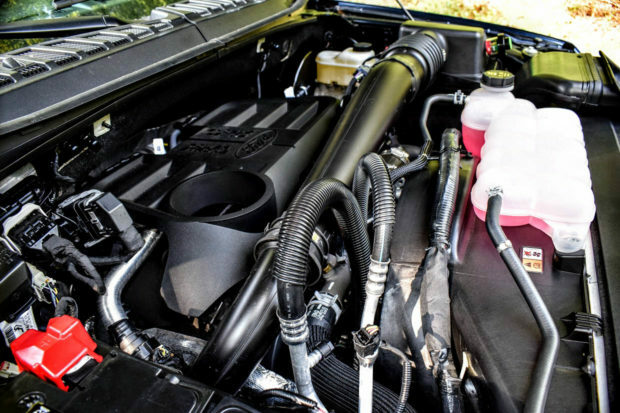 Off the line, revs hold higher for longer, and the seamless transition to interstate speed performance virtually eliminates any complaint one might have in regard to diesel engines providing torque over top-end power. For fans of acceleration it’s the best of both worlds, all available at the push of a button in a diesel-powered pickup. 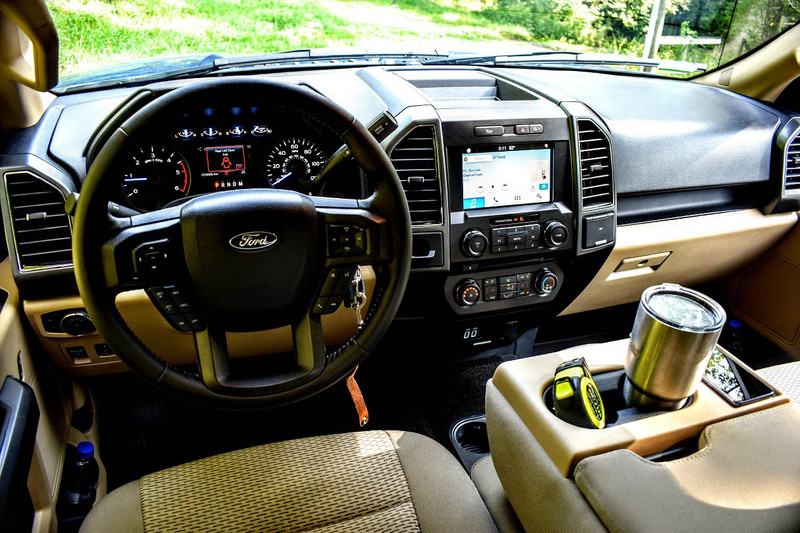 Part of the reason why this pickup packs such a powerful and efficient punch is Ford’s brilliant 10-speed automatic gearbox, a 3.31 ratio axle, and the revised innards of the 3.0-liter V6 itself. Featuring a forged crankshaft, a variable-geometry turbocharger, and direct injection, this British-made engine is almost identical to what one encounters in the Land Rover Td6 diesel, for they are both manufactured in the same factory. Horsepower numbers may sit flush at the 250 mark, but with 440 lb-ft. of torque churning away from 1,750 rpm onward, diesel perks allow Tow/Haul mode to work its magic once fully loaded down. After planing a solid beam of black walnut that had been on the farm for more than an eon, and cutting it down to size the old fashioned way, we loaded up the bed of the truck with a mountain of limestone, and topped it all with various pieces of lumber and trim from the barn. With outboard mounted suspension sitting low over the rear axle, I snapped some quick photos, tied down the day’s haul, and hit the highway in Tow/Haul mode. Even with payload levels nearing capacity, and uphill climbs at every turn, the Power Stroke equipped F-150 pushed onward without hesitation. While in this mode its transmission gearing remained low, allowing the truck to show little sign of struggle when getting up to speed, with top-end power being fluid, if all but a little less eager to offer immediate acceleration kickdowns. Back at the house, with the F-150 fully unloaded and the sun setting in the west, I cracked open a cold beer and admired the vehicle that had may the day’s haul possible. To the untrained eye the Power Stroke version of the F-150 looks all the world just like an average best-selling pickup. But dig deeper and a monsoon of notables all stand at attention. Are the Hankook Dynapro HT tires the best for traction or reduced road noise? Not really. Did the optional spray-in bedliner take a beating and come out unscathed? Without question. Would I recommend upgrading to the larger box configuration for increased hauling capacity? I definitely would consider it if I were you. Another thing to consider is the fact that Ford’s V6 diesel upgrade will run you a cool $5,000 right out the gate, making it even more expensive than the twin-turbo 3.5-liter EcoBoost option. 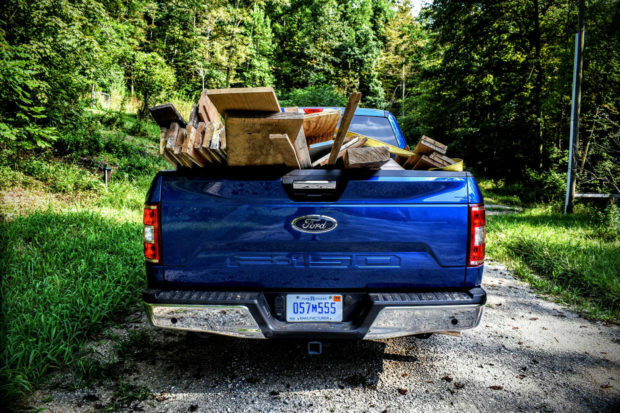 But with its sensational drive modes (including one surprisingly vigorous Sport setting), ability to tow up to 11,400 pounds, a payload limit of 2,020 pounds, and many of the practical amenities modern Ford trucks can offer, the 4×2 workhorse resting in my drive was still winning major points in every segment. So what if the “Equipment Group 302A” cost almost the same amount as the diesel engine upgrade? 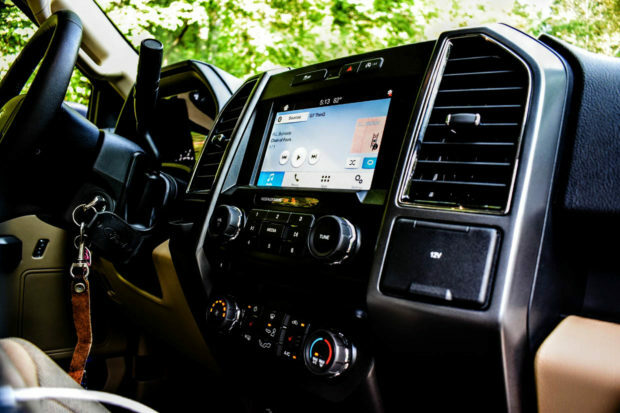 Truck buyers have grown accustomed to these price tags over the years, and at just a tick under $50,000 is but a drop in the bucket when compared to what you get in return via SYNC 3, Sirius XM, reverse sensing, and so forth. 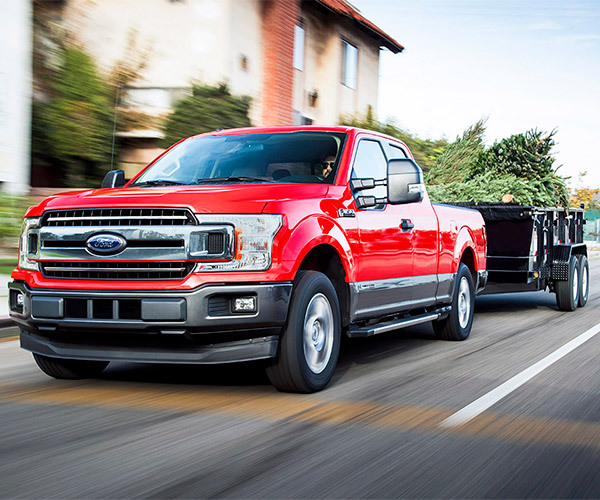 Ford has developed a really solid powerplant option for those who tow on a regular basis and value efficiency over 3.5-liter EcoBoost brute strength. While the diesel upgrade will set you back nearly $2,500 more than the larger twin-turbo gas engine, anyone who tows a rig on a consistent basis will tell you that regular hauling will make-up for this additional cost over time. You just have to ask yourself if it’s worth spending the extra cash up front on a motor that will still be overshadowed by Ford’s larger, more powerful gas-powered V6. Being new to market for 2018, only time will tell how buyers receive this latest Blue Oval diesel offering, regardless of what one auto journalist or another may have hauled back from the farm that week.